The tagline of World Drugs is that they were a world made of generic drugs. All medicines offered at this e-store were generic brands. They offered to deliver their worldwide except for Canada for erectile dysfunction medicines. Customers residing in Canada could order erectile dysfunction drugs if they had an alternate delivery address outside of Canada. A long list of medical categories can be found on the main page of World-drugs.net. They offered different medications that can treat the mentioned conditions. They had drugs for acne, alcoholism, inflammation, infections, depression, anxiety, and allergy among others. They also offered drugs for hair loss, weight loss, diabetes, hypertension, cancer, and HIV. In fact, they offered too many medications from prescription to over the counter drugs. Common medications like pain relievers and contraceptives were also offered here. For erectile dysfunction, they offered generic Levitra, generic Viagra, and generic Cialis. Generic Levitra was sold for $3.85 per tablet at 20 mg while generic Viagra was offered at $1.98 per tablet at 25 mg. a 50 mg sildenafil citrate was offered at $3.75 per tablet and $2.28 per tablet for sildenafil citrate 100 mg. we are not sure why 50 mg was more expensive than their 100 mg generic Viagra tablet. For generic Cialis, the price was $2.53 per tablet for a 10 mg. Customers that were not sure of the brand to take can order their ED trial pack for $15. The pack had a single tablet of 100 mg generic Viagra, a 20 mg generic Cialis, and 20 mg of generic Levitra. For each medicine, World-drugs placed information about the drug such as general information, how does the medicine work, the right dosage to take, possible side effects, what to avoid during medication, and precaution to take for a safer medication. All orders were paid with a credit card at World Drugs. For prescription medicines, a prescription must be presented. There was no minimum order required but the maximum order was for a 3-month worth of supply. Even if your doctor gave you a prescription for more than three months, the store won’t be able to dispense more. Medicines dispensed by World-drugs.net were from their global partners. They partnered with pharmaceutical companies worldwide and they were dealing with directly. All orders over $100 were delivered free of charge. The only delivery method used by World-drugs.net was Airmail because it doesn’t require a signature during delivery. For orders worth less than $100, the shipping charge was $9. Customers can only place an order if they have an account with World-drugs.net. To order, they simply log in, choose the medicine they need and proceed with the checkout and payment. They offered a refund or free reshipping on missing or lost orders. Customers were advised to report issues as soon as possible. World-drugs can be reached via their email at [email protected] or by contacting them via their contact us page. On their contact page, World-drugs.net explained that all transactions in dollars were processed by Bardo Payment Service Provider Panama S.A. The address of the said provider was 50, Torre Global Bank, Piso 31, Oficina 3104, Ciudad de Panamá, República de Panama with a phone number 507 830 5384. World-drugs.net had not won any customer that was willing to write a review about them hence we are unable to find any third-party reviews for this e-store. We found out that they had a testimonial page and here were some of their testimonials. 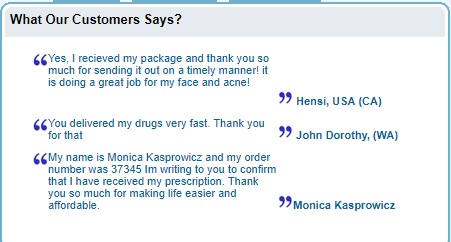 Hansi from California said that her order had arrived in a timely manner and she was glad it worked on her acne. She said it arrived in a timely manner and she was happy about it. The second review was from John and he was happy with the fast delivery of his order. For the last testimony, it was from Monica who expressed how thankful she was with her prescription and order arriving on time. These reviews were from their website hence the tone was very positive for World-drugs. As online consumers, we just don’t believe with on-site reviews because of its high possibility of being fake. With World-drugs.net closing in 2014 or 2015, there are no customer reviews available for 2018. We searched the internet for old coupon codes that World-drugs.net might have released for their customers to enjoy but found none. 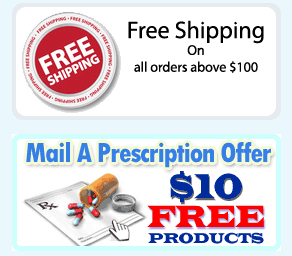 What we found were special offers that their customers can take advantages such as free shipping on orders above $100 and a $10 mail prescription offer. 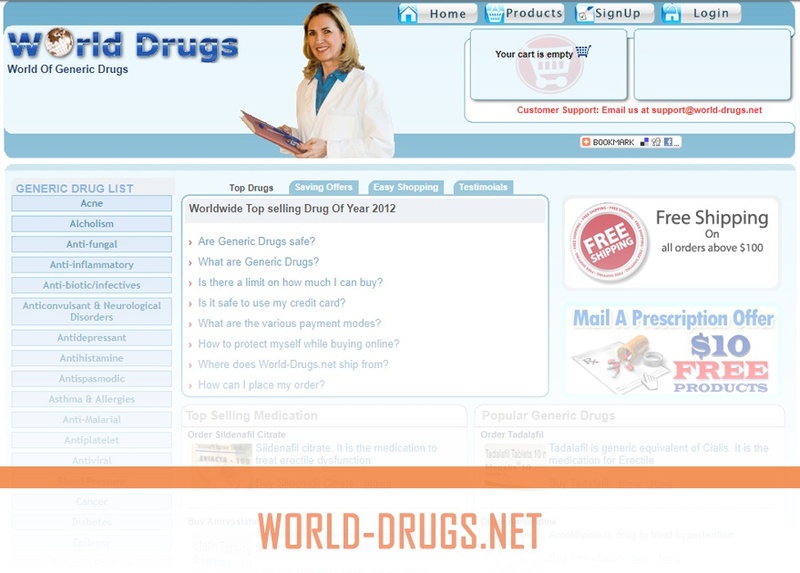 World-drugs.net was an internet drugstore that offered a wide range of medications. We find the list of erectile dysfunction brands limited for this online pharmacy and their pricing a bit higher as compared to other online pharmacies. Their generic erectile dysfunction brands cost above $2 per pill while other online pharmacies offer it for less than $2 each. All medicines offered by World-drugs.net were generic drugs. We would love to learn more about their offers and performance as an online pharmacy but found no reliable online pharmacy to depend on. With the lack of customer reviews, we can say that this online pharmacy needed to prove more. Sadly, they were no longer active.